I set up my Crazyflie 2.0 with PX4 successfully. QGC recognizes it when I plug it in with USB and I did all the calibration required. I connected an Xbox controller and did a calibration on that as well. Next I set up crazyradio PA using cfbridge.py. I can connect to my crazyflie with crazyradio using cfbridge.py however when I launch QGC it simply doesn't connect to the vehicle. I am using MacOS and Windows. 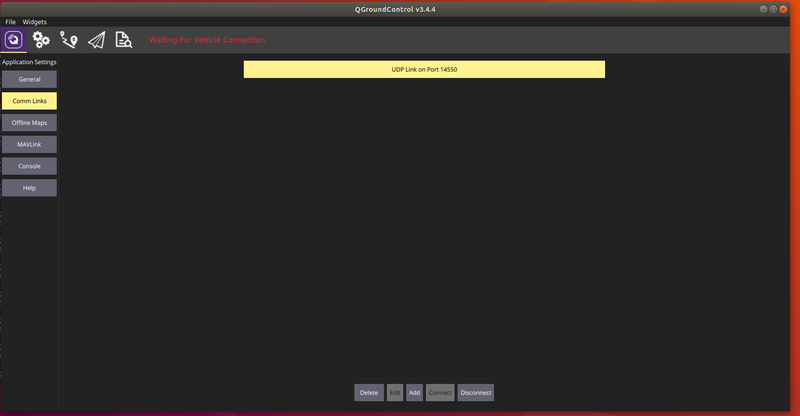 On both platforms (on Windows I used Crazy client instead of cfbridge) the vehicle fails to connect to QGC using crazyradio. I've tried adding a manual connection in Comm Links. Nothing works. I feel like I am missing something. Please guide me. Any help is appreciated. I am not sure what you are asking exactly. You want me to post the bootloader code? Or are you asking me if I can get a bootloader on the crazyflie? [D] at /home/travis/build/mavlink/qgroundcontrol/src/QGCApplication.cc:263 - "Settings location "/home/arnold/.config/QGroundControl.org/QGroundControl.ini" Is writable? : true"
[D] at /home/travis/build/mavlink/qgroundcontrol/src/QGCLoggingCategory.cc:98 - "Filter rules "*Log.debug=false\n""
[D] at /home/travis/build/mavlink/qgroundcontrol/src/PositionManager/PositionManager.cpp:39 - "QGeoPositionInfoSourceGeoclueMaster(0x1a51ca0)"
[!] at :0 - "Failed to set Geoclue positioning requirements. Geoclue error: org.qtproject.QtDBus.Error.InvalidObjectPath"
[E] at /home/travis/build/mavlink/qgroundcontrol/src/PositionManager/PositionManager.cpp:111 - "QGCPositionManager error 2"
[D] at /home/travis/build/mavlink/qgroundcontrol/src/Vehicle/MAVLinkLogManager.cc:360 - "MAVLink logs directory: "/home/arnold/Documents/QGroundControl/Logs""
[E] at :0 - "QSslSocket: cannot resolve CRYPTO_num_locks"
[E] at :0 - "QSslSocket: cannot resolve CRYPTO_set_id_callback"
[E] at :0 - "QSslSocket: cannot resolve CRYPTO_set_locking_callback"
[E] at :0 - "QSslSocket: cannot resolve ERR_free_strings"
[E] at :0 - "QSslSocket: cannot resolve EVP_CIPHER_CTX_cleanup"
[E] at :0 - "QSslSocket: cannot resolve EVP_CIPHER_CTX_init"
[E] at :0 - "QSslSocket: cannot resolve sk_new_null"
[E] at :0 - "QSslSocket: cannot resolve sk_push"
[E] at :0 - "QSslSocket: cannot resolve sk_free"
[E] at :0 - "QSslSocket: cannot resolve sk_num"
[E] at :0 - "QSslSocket: cannot resolve sk_pop_free"
[E] at :0 - "QSslSocket: cannot resolve sk_value"
[E] at :0 - "QSslSocket: cannot resolve SSL_library_init"
[E] at :0 - "QSslSocket: cannot resolve SSL_load_error_strings"
[E] at :0 - "QSslSocket: cannot resolve SSL_get_ex_new_index"
[E] at :0 - "QSslSocket: cannot resolve SSLv3_client_method"
[E] at :0 - "QSslSocket: cannot resolve SSLv23_client_method"
[E] at :0 - "QSslSocket: cannot resolve SSLv3_server_method"
[E] at :0 - "QSslSocket: cannot resolve SSLv23_server_method"
[E] at :0 - "QSslSocket: cannot resolve X509_STORE_CTX_get_chain"
[E] at :0 - "QSslSocket: cannot resolve OPENSSL_add_all_algorithms_noconf"
[E] at :0 - "QSslSocket: cannot resolve OPENSSL_add_all_algorithms_conf"
[E] at :0 - "QSslSocket: cannot resolve SSLeay"
[E] at :0 - "Incompatible version of OpenSSL"
[D] at /home/travis/build/mavlink/qgroundcontrol/src/QtLocationPlugin/QGCMapEngine.cpp:225 - "Map Cache in: "/home/arnold/.cache/QGCMapCache300" / "qgcMapCache.db""
[E] at :0 - "QSslSocket: cannot call unresolved function SSLv23_client_method"
[E] at :0 - "QSslSocket: cannot call unresolved function SSL_CTX_new"
[E] at :0 - "QSslSocket: cannot call unresolved function SSL_library_init"
[E] at :0 - "QSslSocket: cannot call unresolved function ERR_get_error"
[E] at /home/travis/build/mavlink/qgroundcontrol/src/AnalyzeView/MavlinkConsoleController.cc:109 - "Internal error"
No. I specifically stated that I used crazyradio PA to connect.